The original idea was called Airtrack. This was a BAA promotion(just like Heathrow Express(HE)) of rail connections from Heathrow Terminal 5 (where space has already been reserved for extra rail tracks/platforms) via Staines to Waterloo, Guilford and Reading. This idea TRANS-TRAX analysed on 30th June 2010 in a posting on this blog called Airtrack - is it worthwhile?. There were some good elements but we thought that the idea was flawed. Certain elements proved to be insurmountable obstacles - such as the extended closure of level crossings on the Staines - Reading section, and the lack of train paths to fit the trains into the heavily scheduled services on the South West network. The result was that BAA cancelled the project in April 20011. What has been little mentioned is the fact that the whole project was an idea of, and to be financed by BAA (the owners of Heathrow). The expense of running sets of dual system trains (to operate with overhead electrical supply, and then on the South West Train Network with a third rail trackside connection) also proved to be onerous with limited benefit (lack of train paths) and possibilities to increase frequencies. The focus, anyway, was on benefit to BAA, not service to the passengers. So the project died its death. However, a partial solution is being worked on. On 5th September 2011 an article appeared on the BBC website titled "Hammond Heathrow £500m rail link plan consideration"
This is being sold as direct trains from Cardiff and Bristol into Heathrow. There will not be that many per day so would not make such a direct connection viable. The article was echoed on 11th September, in a more realistic vein by the Reading Chronicle, titled "Airport rail link hopes run high" Here the focus in the article is on the 4 train per hour shuttle between Reading and Heathrow Terminal 5. This is much more realistic. It would replace the coach shuttle between the two cutting travel time to under 30 minutes. It thus offers a direct connection at Reading from all points west to Heathrow, opening the possibility of direct trains from the West (and South Wales into the airport). The shuttle would also mean that passengers who, at present, go into Paddington to catch the HE back to Heathrow would not have to do so. The coaches services from Reading drop passengers off at T5, T1 and T3, while on the return leave from the Central Bus Station and then T5 and on to Reading. Each one way trip takes just under an hour. By providing the rail connection then at least seven coaches could be taken out of service, with the resulting savings of diesel oil and elimination of exhaust fumes. As the Readng Chronicle article explains the rail link would depart Reading along the GWML towards London. Then it would leave the GWML just east of Langley station, run across country for about 5.5kms. to enter T5 in a tunnel to the two unused platforms which already exist there. Without doubt, by the time the link is built the GWML will be electrified to Reading at least. Thus, it would only be necessary to extend the overhead electric power supply to T5 on the spur from Langley. The transport units can be the same as the ones used for the Heathrow Express and/or the Crossrail schemes. On the other hand the connection Reading - Heathrow should not be looked at in isolation. The Reading Rail link will connect into T5 using two platforms which already exist but, as yet, have no takers. The question, therefore, arises about what can be done with this connection. The downside is that there is no further connection to other terminals. Can this be solved? Of course it can. As we said before the Reading link and the HE link will use the same vehicles and overhead power system, which obviously means the two can run over the same lines. Therefore, the same systems can be used over the same lines as far as they will go. To run the Reading link from T5 to T3/T1 is so possible. To continue it to Paddington (just like the HE) is possible but a non-starter, since it is easier to go direct to Paddington from Reading along the GWML than through the airport. 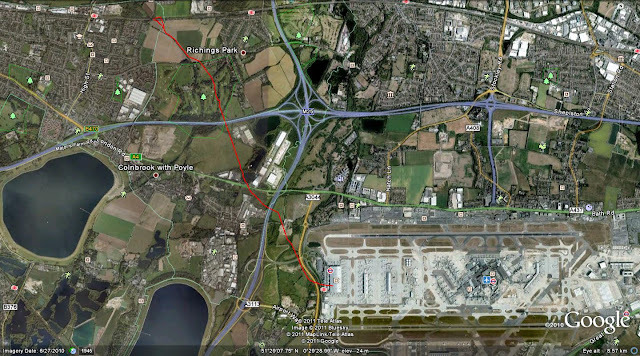 On the other hand, if the decision were made to extend the Reading link to T3/T1 and then turn south to T4, we would end up with all the terminals connected to the rail system for the subsequent benefit of passengers, and subtracting a substantial number of cars from the roads. Then, if the thinking were to extend the system the 2.5 kms. to Feltham rail station, we could provide the (old Airtrack idea) vision of a connection to Twickenham, Richmond, Clapham Junction and Waterloo, with all the connections to South West Trains (and others) which this implies. However, our thoughts do not stop there. We refer you to our article on this blog , called Fast Trax 2 - the case for a Southern High Speed Alternative. This we call SHSL published here 24th February 2010. Since then our ideas have not changed - in fact with this news, actually reinforced. To connect T5 to the GWML and subsequently Reading and beyond, opens up all sorts of possibilities. From this conclusion we should not exclude services to Southampton in one direction, but more likely services to Oxford and Birmingham in the other (with all the connections implied there). The expensive and unnecessary HSR2 link from Central London would then be called into question. We,even, go further and look at the possibilities of connecting the Irish boat services at Fishguard (from Rosslare) to Reading, to Heathrow and onwards. By onwards we see the line extended to Gatwick(thus providing the much sort after rail link to that airport). But why should services stop there? Can they not be extended to Ashford and on to the Channel Tunnel and Lille? Here we would be talking about passenger and freight traffic which would eliminate from the roads all the lorries going to Ireland through Fishguard (if not other ports as well). This would be a tremendous saving in diesel oil and all the fumes that it implies by taking off the roads a very large number of lorries on a European designated priority route between Ireland, the UK and Continental Europe. The ideas expressed in the said blog are still valid and worthwhile. It just needs a bit of common sense and political will to set the ball rolling - even if the whole process is done in a step by step approach.